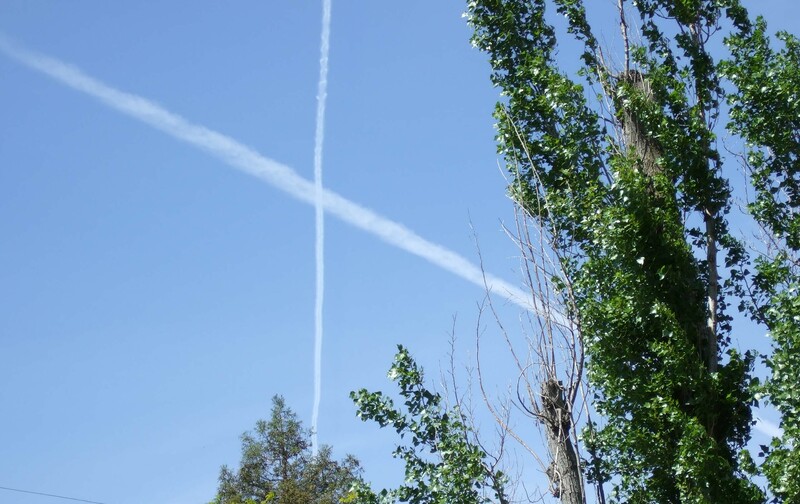 According to several paranoid conspiracy theorists (PCTs), chemtrails look like contrails but they are intentionally created by unknown people to poison us with unknown chemicals for some unknown reason (Thayer). 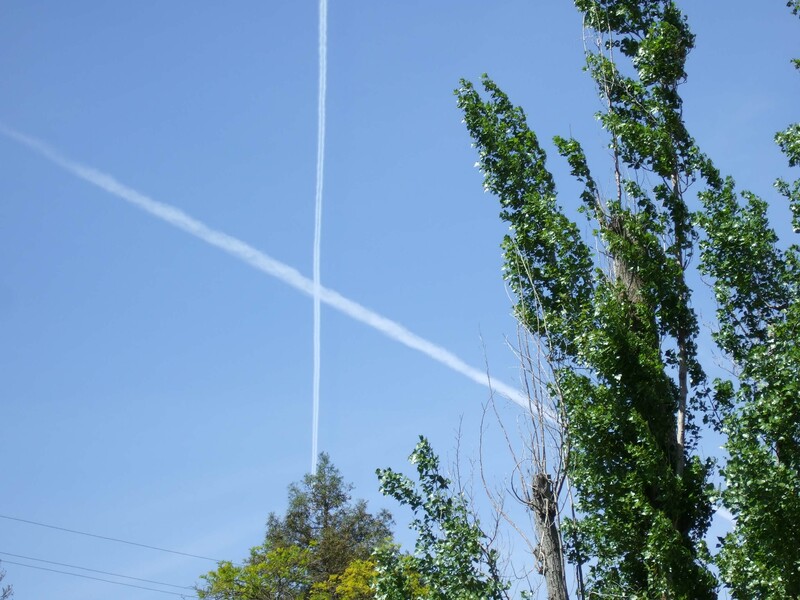 One PCT, William Thomas, claims that chemtrails are part of a "massive, covert government operation to delay global warming by increasing the amount of sunlight that is reflected back into space" (Sheaffer). That a government which, until recently, didn't even acknowledge that global warming is a major concern would have a secret program to delay global warming is curious. Nevertheless, the PCTs believe that there has been a noticeable change in cloud formations over the past decade or two and that this is evidence that something sinister is happening. They may be right, but as one critic of the PCTs notes: if there has been a noticeable change in cloud patterns at high altitudes over the past ten to twenty years, the change may be due to global warming (Wickson). 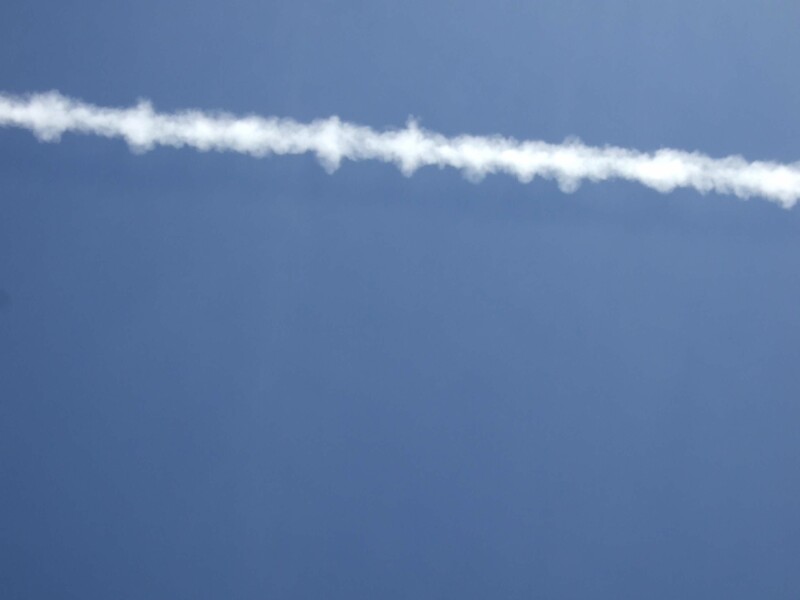 Contrails are condensation trails formed behind jet airplanes when they burn fuel in the upper troposphere where "temperatures are very low and the condensation droplets rapidly freeze into ice crystals" (Reynolds). "When burned, fuel containing hydrogen is combined with oxygen in the air to form water vapor, among other byproducts" (Wickson). "Contrails form when water vapor in the exhaust from jet-engines freezes high in the troposphere where airliners cruise" (Clarke). 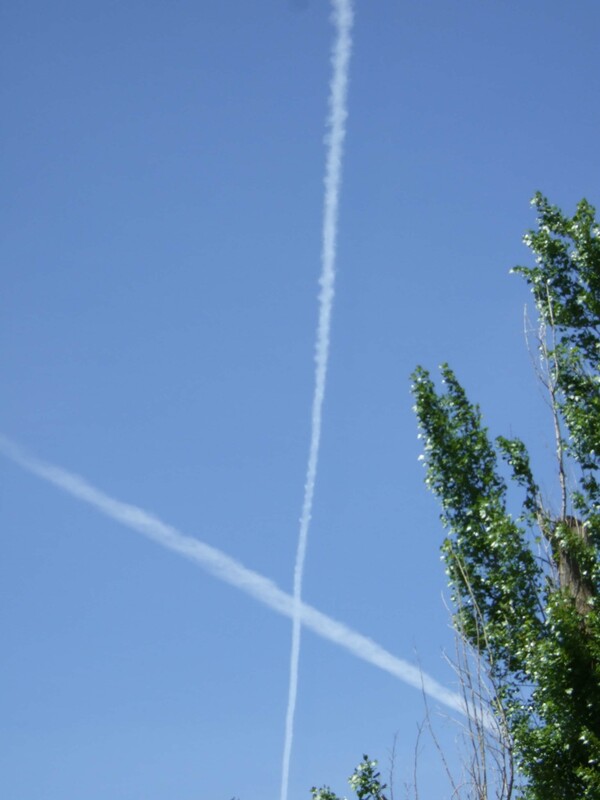 If the ambient air is dry, contrails will evaporate almost immediately. The ambient air must be "close to saturation with water" for a condensation trail to form (Reynolds). 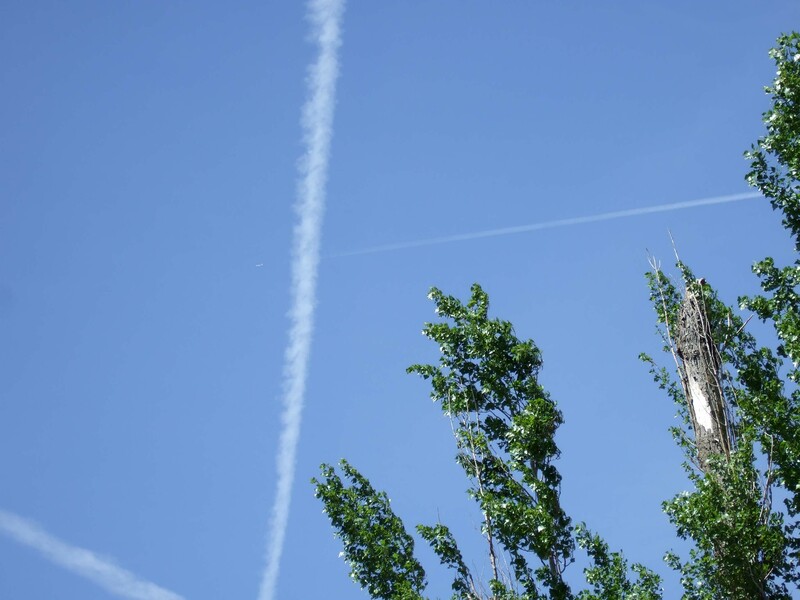 Contrails have been the object of scientific study for some time and are known to "seed the growth of cirrus clouds that can grow to enormous size." 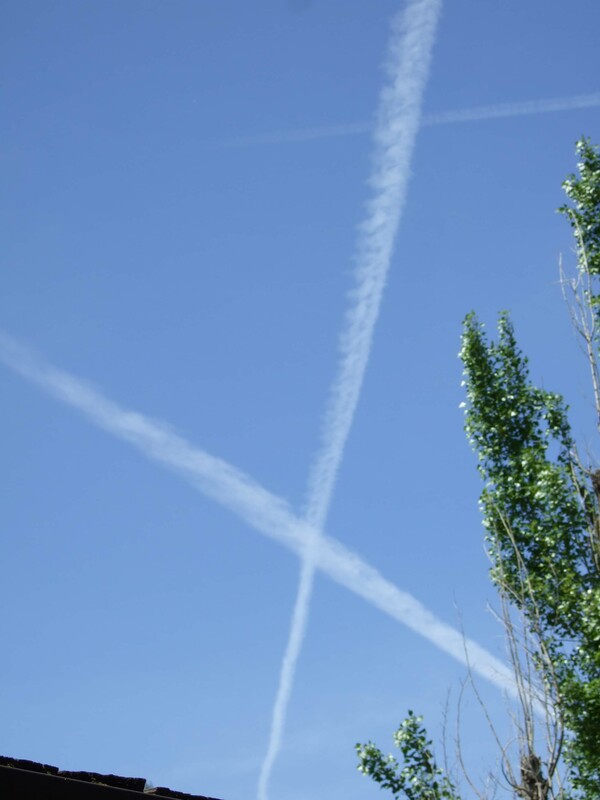 Contrails "appear to increase global temperatures by trapping in reradiated heat" (Sheaffer, who cites a ten-year study by the French climatologist Olivier Boucher published in Nature 397:30, 7 January 1999). 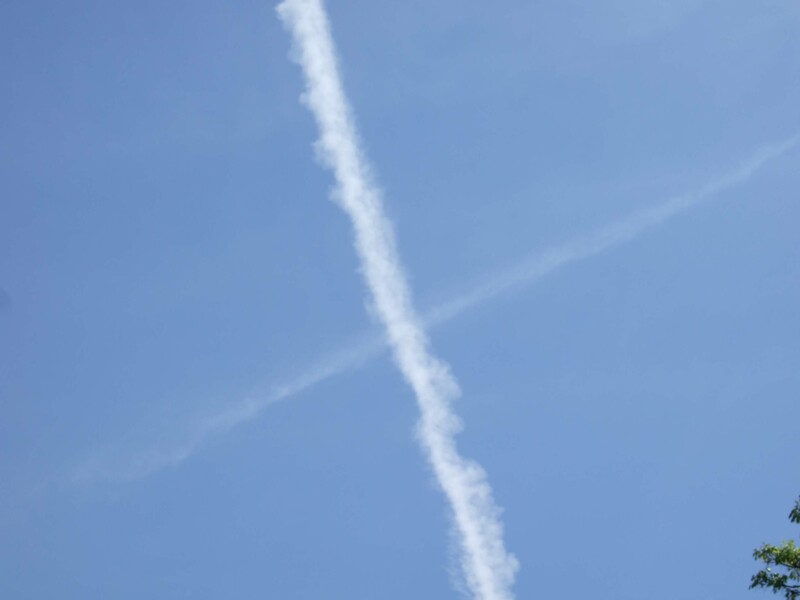 "Depending on a plane's altitude, and the temperature and humidity of the atmosphere, contrails can vary enormously in their thickness and duration, and therefore in their reflecting or insulating power. Most last minutes or hours, some last days" (Clarke). "Fluffy rows of cirrus clouds created by the increasing number of jet contrails can sometimes fill half the sky" (Kotulak). 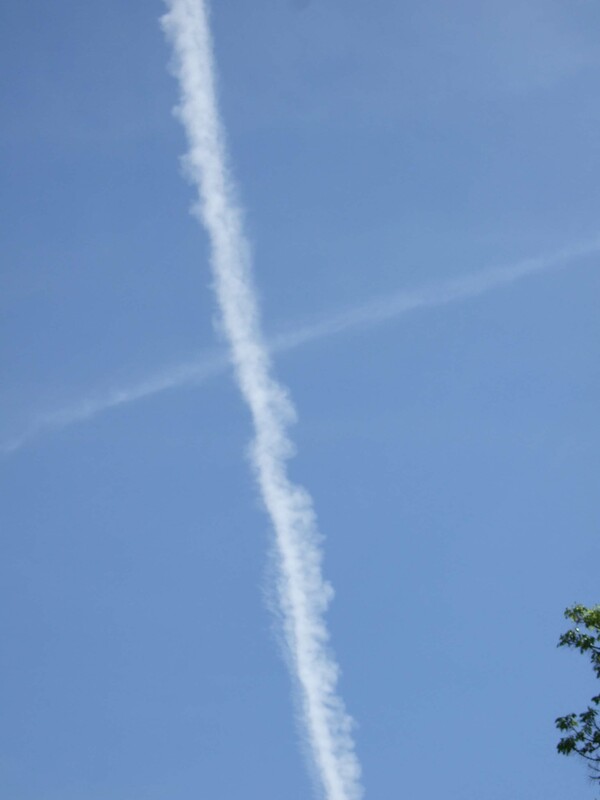 PCTs deny the scientific evidence and maintain that contrails do not turn into puffy clouds. Patrick Minnis, a senior research scientist at NASA's Langley Research Center in Hampton, Virginia, studied satellite images of contrail clouds of military craft during the three days airports were shut down in the U.S. after the 9/11 attacks. 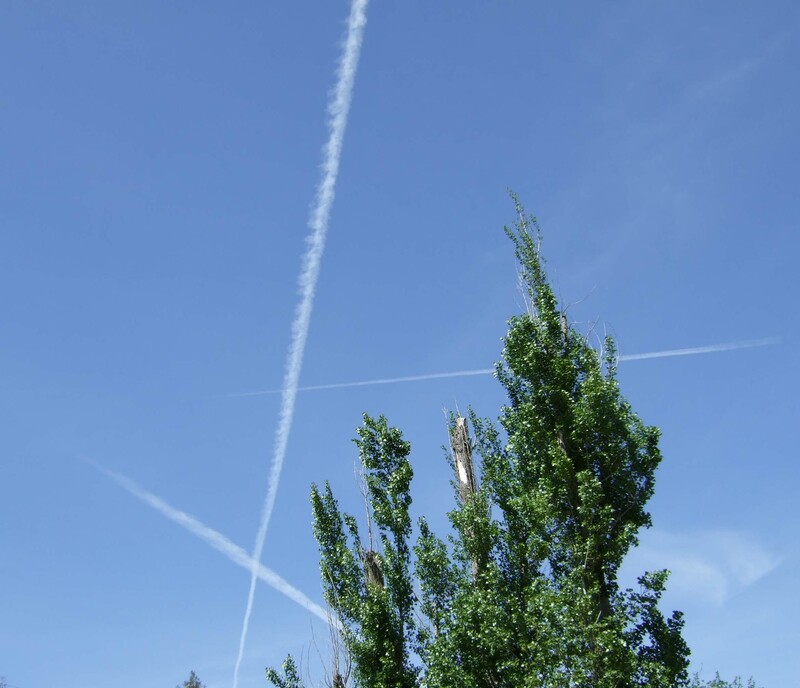 On a typical day, an estimated 13,000 planes crisscross the nation's skies. 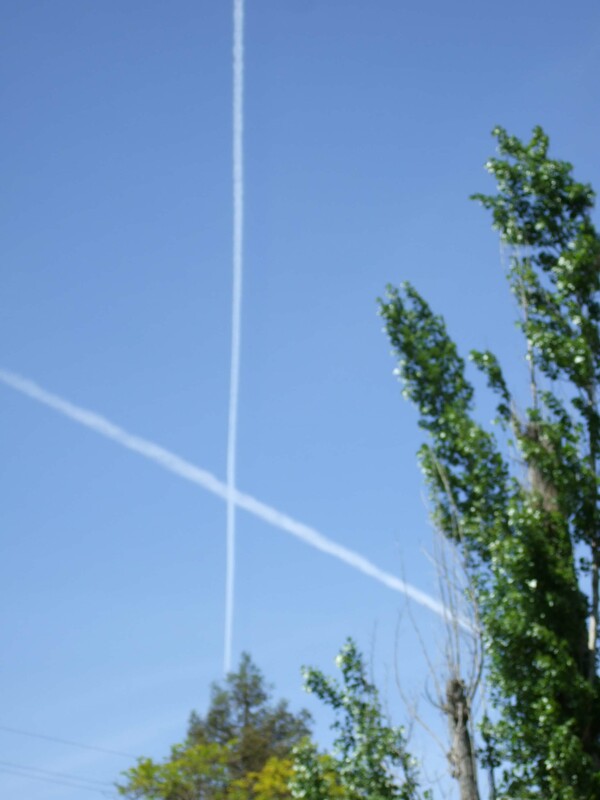 They create so many contrails that cross each other's paths that the satellite images are just a blur. 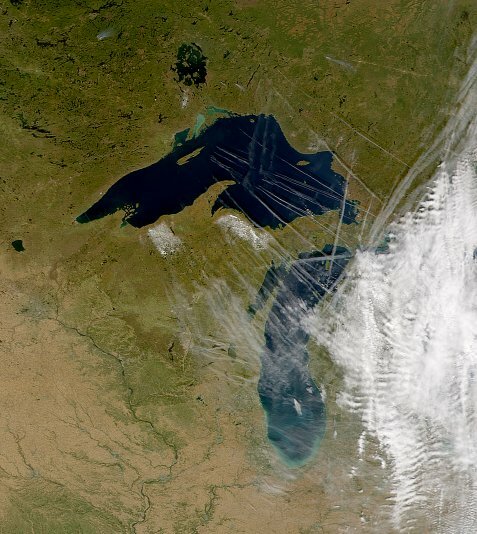 Minnis found that the cirrus clouds formed from these contrails lasted an average of six to eight hours and that six to eight contrails can grow to form a cloud cover the size of Massachusetts (Kotulak). 1. Military aircraft are “spraying” biological or chemical agents via contrails and are flying formations which sometimes form odd shapes. Consider, however, that any biological or chemical agents released at 25,000 feet or above would be absolutely impossible to control, making any measurement of effects on the ground nearly impossible. (Presumably, the perpetrators of this evil deed have immunized themselves against the effects of their poisons.) Such an exercise would be pointless, unless you just wanted to pollute the atmosphere. And where is the evidence of the illnesses being caused by these agents? Surely, these chemicals have been identified and the diseases have names? (Yes, according to Clifford E. Carnicom, who claims he's analyzed ground-level air samples and they contained a lot of bad stuff. * Of course, we have to take it on faith that these ground-level samples blew his way from some government plane that dumped toxic chemicals somewhere in the sky at some time, presumably in the past.) If you have a desire to poison your people, do it on a night when the wind isn't blowing and fly at low altitude, so you can have some control over where your poison lands. And use something that's invisible. Cobwebs and clouds dispersed in the troposphere might land more than a thousand miles from where you spew them out and would be visible to many people. According to the PCTs, governments and pharmaceutical firms poison us because, as one of them puts it: "Chronically sick people are more useful than dead people. "* How so, a rational person might wonder? If you are chronically sick, then you need expensive drugs and you are easier to enslave. Of course. Why didn't I think of that? On the other hand, if people weren't sick they could get jobs, pay taxes, stimulate the economy, pay for their drugs, and work for me. 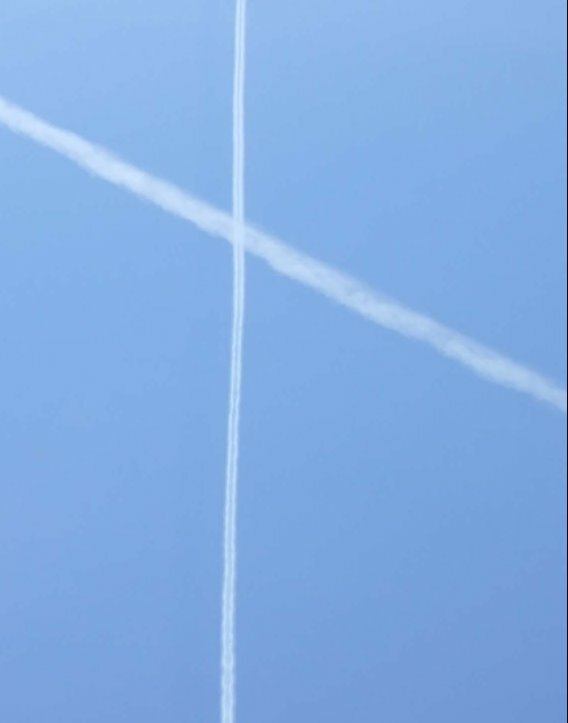 The most reasonable explanation for the abundance of contrails in so many shapes and sizes is that (1) there has been an increase in commercial air traffic and (2) global warming is a reality. It does not follow from those facts—if they are facts—that there have not been government or military experiments that have involved airplanes spewing chemicals in the atmosphere (see Cole). But, it is a long way from that fact—if it is a fact—to supporting the notion that governments or pharmaceutical firms are systematically releasing chemicals into the atmosphere to make us sick as part of some twisted government plot. See also 9/11 conspiracy theories and area 51.
new THE CHEMTRAIL CHALLENGE : If you sincerely believe there is a chemtrails conspiracy going on, you have a moral obligation. If you think there’s an unhealthy operation led by government agencies that is making us sick or controlling our minds (or both), you really have to do something about it. Psychic Vibrations Conspire This! by Robert Sheaffer, Skeptical Inquirer, November/December 2001. Leonard A. Cole. (1988). Clouds of Secrecy. Littlefield Adams Quality Paperbacks.